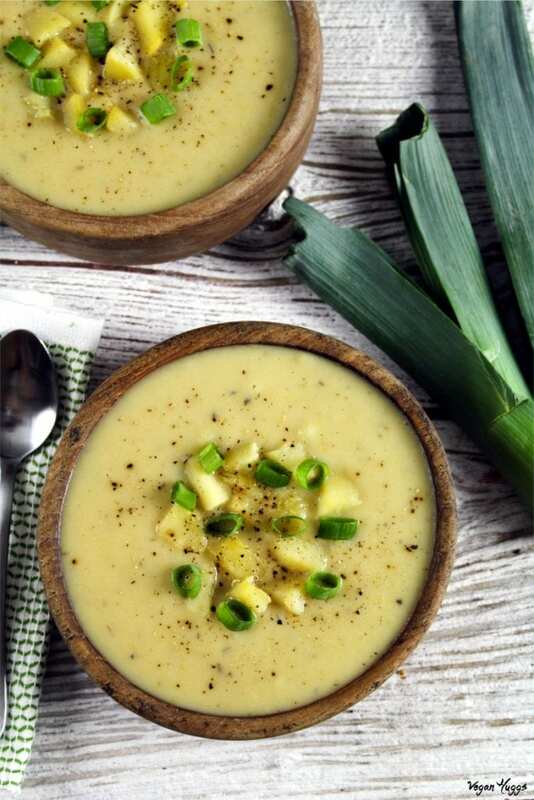 Vegan Potato Leek Soup – the combination of creamy potatoes, delicate leeks with herbal notes of rosemary and thyme will have you going back for seconds! It’s dairy-free, gluten-free and just good for you, too! I love them baked, broiled, fried, mashed or soup-ified! They are especially comforting when the cooler weather hits, so my kitchen counters are overflowing with those heavenly gems. 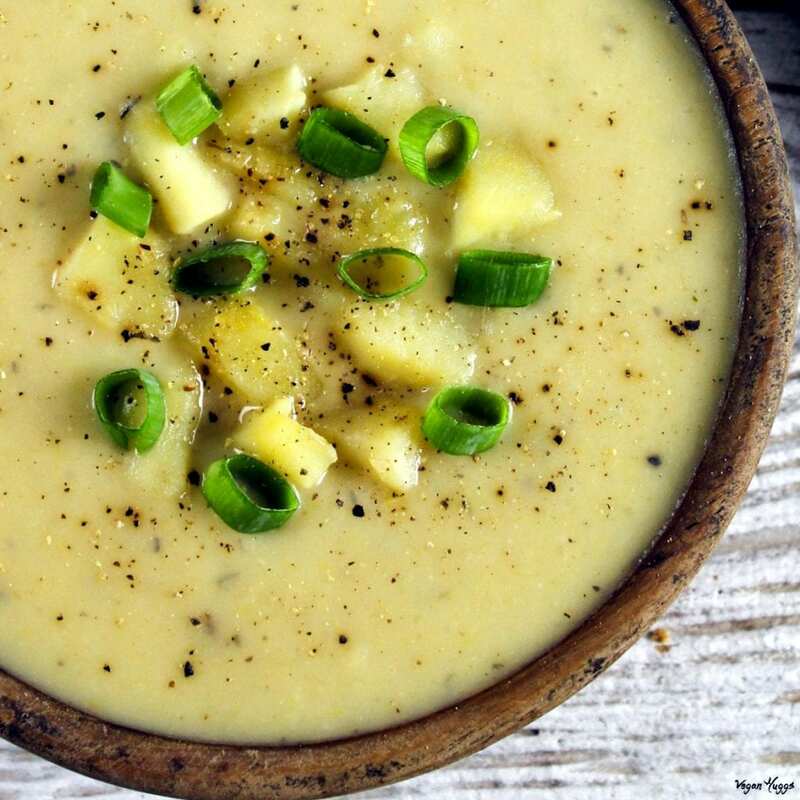 This Vegan Potato Leek Soup fits the bill when it comes to comfort and I make it all year winter long! It’s satisfying, belly-warming and oh-so-cozy! I’m a big soup lover and It’s definitely my go-to meal in the winter. It’s easy to make, inexpensive, hearty, filling and delicious! Plus, it freezes really well too, so I always have a variety to choose from. It makes weeknight dinners a breeze, and we never get bored. This Vegan French Onion Soup is another favorite of mine and I make it often. It’s so rich & savory and makes the house smell heavenly! Oh, yes, it’s topped with bubbling vegan cheese too! 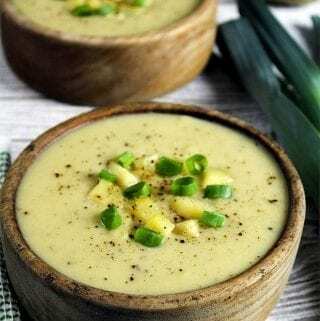 IS VEGAN POTATO LEEK SOUP GOOD FOR YOU? Yes! Potatoes are an excellent source of potassium, zinc, copper, B6, vitamin C, phosphorus, manganese, niacin, fiber, and pantothenic acid. Lots of antioxidant power! They are healthy and delicious! Unfortunately, deep frying doesn’t make them healthy anymore, so I enjoy french fries in moderation or I bake them instead. Leeks have an excellent source of vitamin K, manganese, vitamin B6, copper, iron, folate, magnesium, vitamin E, calcium, omega-3 fatty acids, and vitamin C. They have a subtle flavor compared to their onion counterpart. WHAT DO I NEED FOR VEGAN POTATO LEEK SOUP? You won’t taste the coconut milk, but if you prefer, you can use any unsweetened non-dairy milk. You can even omit the milk altogether and it will still be really creamy. The potatoes work most of the magic anyway. 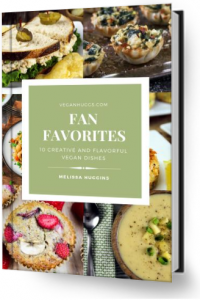 CAN I FREEZE VEGAN POTATO LEEK SOUP? YES, it freezes really well! I just leave out the coconut milk from the portion that I’ll be freezing. When I’m ready to make it, I defrost it overnight in the fridge and heat up slowly on the stove. Then I’ll add the coconut milk when it’s fully heated. Want to learn more about properly freezing and storing soup? Check out this informative article HERE. WHAT KIND OF TOPPINGS WORK WELL IN THIS SOUP? You can top it with almost anything like Fresh-Cut Chives, Green Onions, Vegan Bacon, Swirled Coconut Milk, Fresh Cracked Pepper, a Pat of Vegan Butter, Vegan Sour Cream, Crushed Red Pepper, Smoked Paprika, Squeeze of Lemon (highly recommend), and so much more! It goes well with a big ol‘ loaf of crusty bread too! 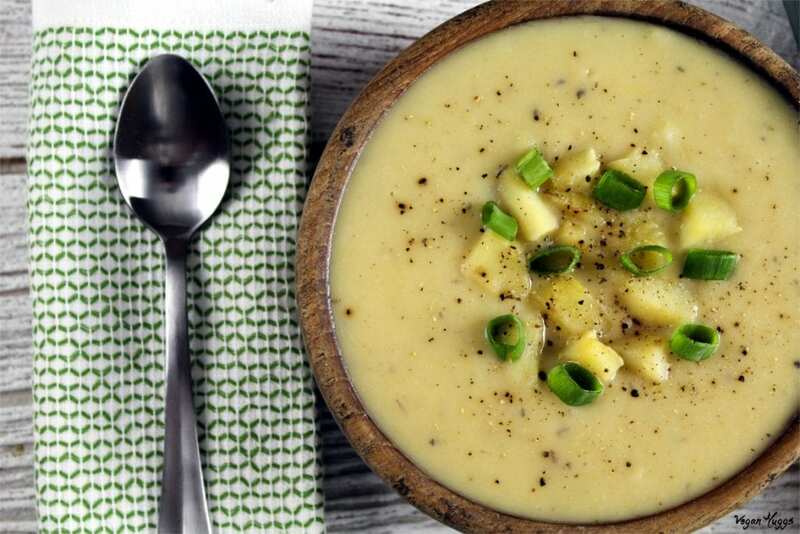 Are you ready to try this unbelievably creamy, comforting and satisfying soup? 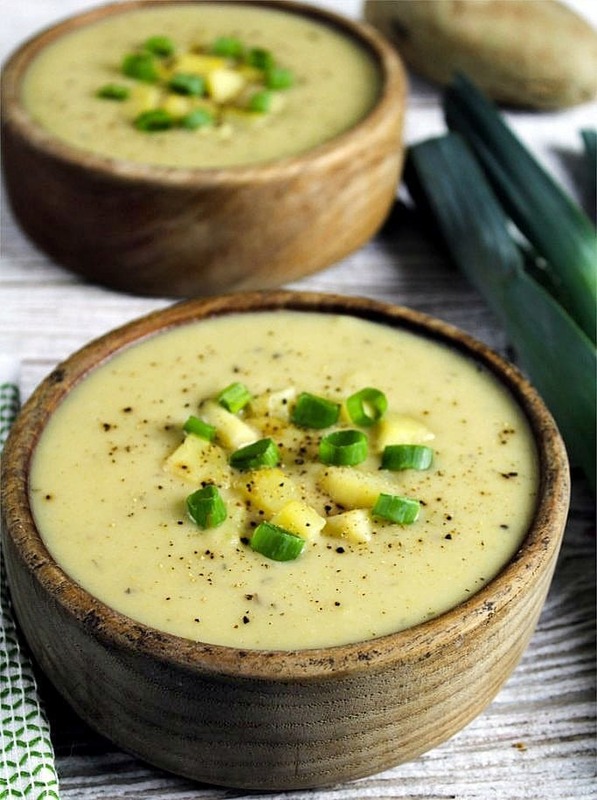 Vegan Potato Leek Soup - the combination of creamy potatoes, delicate leeks and herbal notes of rosemary and thyme will have you going back for seconds! It's dairy-free, gluten-free and just good for you, too! *Leeks can be very dirty inside the layers because they are grown in sandy soil. To clean thoroughly, cut off the dark green part and discard (or save for stock). Cut off the roots, and slice the stalk lengthwise in half. Now slice the entire leek into pieces. Place in a small bowl of water and swish around to release the dirt. Place in a colander and drain well. * If you don't have vegan butter, you can replace it with olive oil. *If you don't like coconut milk, my second choice for this recipe would be unsweetened soy milk, because it has a richer & creamier texture, but any plant-based milk will work. Want to try this soup in the Instant Pot? Find my recipe HERE. Trying it tomorrow.cant wait. I’ll use baby leeks ???? Wow!! I’ve never had potato and leek soup before (I just never thought it sounded appealing) but I’ve definitely been missing out! This recipe is so delicious!! Thanks for sharing! This looks and sounds so good! Will be perfect to take to work! I especially appreciate the nutritional info at the end! I wish everybody did that! Thank you! Thank you, Bernadette! I have taken it on long car rides and it holds up nicely. Stays perfectly warm in my thermos too. Am now following you on Pinterest! Lovely website and your initiative to save our planet and our animals. You are a lovely example for everyone … in particular our youth. Bravo! I made this early this morning, it’s sitting in the slow cooker keeping warm right now! It tastes phenomenal… Thank you so much for this recipe. My hubby and i loved this soup. I adfed a pinch of tumeric and cayenne pepper to each bowl along with some sliced cooked carrots. So easy and delish! Hi Melinda! Great news! Thank you for making it. I love the addition of turmeric, cayenne and carrots. I’m going for that next time… sounds good 🙂 Thanks for the idea! In the process of transforming my diet to plant based, mostly vegan. So glad to find this recipe. This soup was really delicious! Very flavorful. Love the hint of lemon. I it with no salt vegetable broth. Delicious. I literally just finished making this soup for dinner, and I can say I am pleasantly surprised! I was a little skeptical about the coconut milk, but it doesn’t taste overly coconutty at all. It was perfect. My husband likes it, and I really do think it is fantastic! Thought I would let you know that I love this soup 🙂 it became a staple in our home. I buy leeks every week to have this soup because it is so simple and SO delicious! Thanks for the recipe! Thank you!!! I loved it. This is the best potato leek soup I have ever had ???? I just made it as a meal for the work week but it was SO delicious I had to have a bowl now! Just made this, and I subbed in Yukon golds for russets because I don’t like taking the time to peel potatoes :/ I appreciated your addition regarding cleaning the leeks, and I’ve also never thought of keeping the tops for broth. So I have a veggie leftovers bowl going for broth in a few days. The Yukons turned out great, and the lemon really adds the final flair. Thanks, it’s a welcome addition to my Whole30 work lunch menu. Hi Melissa! Do you think cooking it in a crock pot on low for a couple hours would work? I made this soup today and replaced two potatoes with some chopped carrots and it turned out amazing! Thank you for this recipe I will be making it every winter now! I just made this soup w/out the spices and it’s very tasty. The only thing I would suggest is maybe mentioning something about rinsing the leeks well to get all the sand out in case this is someone first attempt w/leeks. I’ll make this soup again. Made this tonight and OMG it’s amazing. Best potato soup I have ever had, vegan or not. I can’t wait to make this again and I’m really looking forward to the leftovers! So glad I gave this a try, thanks for sharing. Thank you for the recipe. So good with the lemon and bay leaf. Edited the coconut or olive oil with avocado oil to wonderful flavor and goodness.